I remember, today and always. War’s not the answer most of the time; it’s often an excuse that veils another agenda. But that’s not going to stop me from honouring the men and women whose job it was/is, or who volunteer(ed), to go out and risk their lives in confrontations beyond what most of us can envision. It’s their commitment and courage I honour on Remembrance Day. I honour our peacekeepers, too, the people who go to other countries to help rebuild after times of turmoil. And support staff — doctors, drivers, cooks, all those people who are necessary and who rarely get recognition for being in danger as well. And those left at home, who carry the double burden of hope and dread for their loved ones. There has to be a better way. But even when someone figures it out, I’ll keep on saying thank you to all those individuals who gave lives, limbs, time, and innocence to the wars. I honour and respect their personal decisions, even if I disagree with the governmental decisions that created the need for them. This entry was posted in Deep Thoughts, Weather, Seasons, & Celebrations, Words Words Words on November 11, 2015 by Autumn. Last night, my grandmother passed away. It was a quiet passing; my dad says that she’d slipped into a comatose state, and died about twenty-four hours later. She was exactly one month short of her ninety-ninth birthday. We started losing her a while ago, though. Her memory became less and less sharp until she lost most of her short-term memory, and the most recent of the long-term stuff began to disintegrate as well. She ceased recognising people. She had to ask over and over who my dad was when he flew out to visit her. When I was little, she kept two very special things in her handbag for me to play with if we had to wait somewhere. One was tiny crocheted blue doll with a silky printed Asian-style face, and the other was a tape measure. Oh, that tape measure. I don’t recall the colour, but it was one of the cased ones that would lock when you stopped pulling the tape, and had a button to press when you wanted to retract the tape again. It fascinated me, and scared me a little too, because the tape would snap back pretty sharply. My mother had regular cotton tape measures, so this one was extra-special. When I bought my first retractable tape measure last year, I was pretty excited to own one of my very own. I think of her every time I use it. I can’t find the box with all my photo albums in it. When my parents went out to Vancouver to help her downsize in preparation for eventually moving into the care home, my dad couriered me a box full of photo albums and keepsakes. She’d kept a series of albums with pictures of me from birth onward. I found one to include below in a box of my own photos, so that will have to do for now. She worked at the Valois library for a time (possibly when it was first opened? ), right around the corner from where I now have my orchestra rehearsals, and around the corner from where friends now live. One of the houses my dad’s family lived in was right around the corner from the apartment blocks where I lived for several years in Dorval, too. She was always tickled to know I was living steps away from where she’d lived, decades and decades before. She lived in West Vancouver for most of my life, though, with my granddad until he passed away when I was a teenager. We visited them about once a year, though. They lived in an apartment building that had an elevator and a pool, both very exciting to a small child. When we visited, I used to love paging through her huge hardcover Royal Doulton figurine collectible book, sitting next to her tea cart. You could look right out over the water from the windows of their apartment, and walk along the seawalk to the little beaches, where we’d sort through rocks and driftwood. Some days we’d go to Ambleside Park and feed the ducks, which was always terrific fun. Right at the base of the apartment building we could sit and wave at the Royal Hudson as it steamed by in the morning, and the engineers would wave back. (When I was older I finally got to ride the Royal Hudson on its excursion up to Squamish.) My first trip alone as an unaccompanied minor was flying out to see them when I was in high school. My gran was always there for my graduations (and probably most of the plays I was in, too, although I don’t remember), right at the front, snapping photos with her camera. While I smile at it now, it was mortifying at the time. (Notably, she left the lens cap on at my high school grad ceremony, so it was all for naught.) She followed me around the dance floor at my high school grad dance and snapped photos, too. There’s a hilarious one of me with my head twisted away and my poor date caught looking open-mouthed at the camera. She thought it was just wonderful that I danced a box waltz for a while with one of my friends, too; fortunately that escaped photographic immortalization, because we were both staring at our feet and counting. 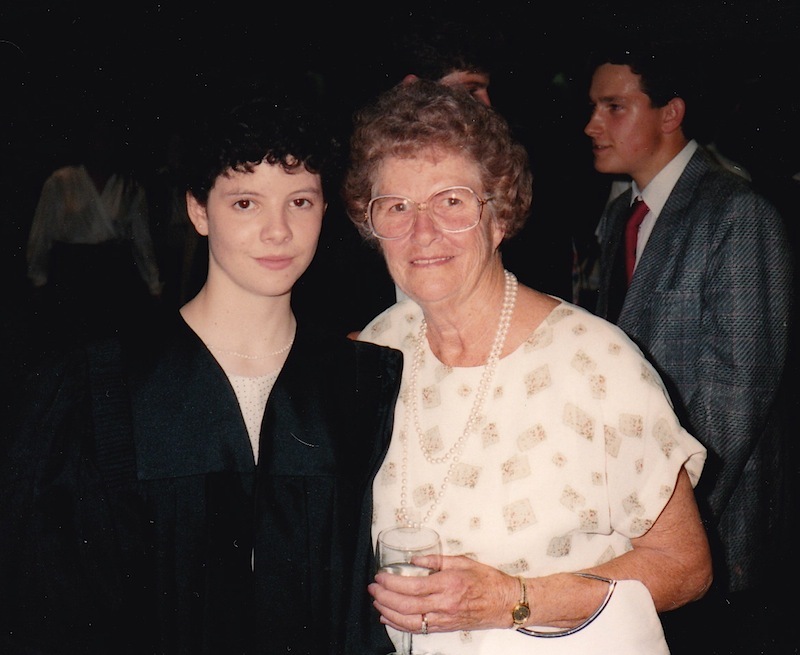 This is Gran and I at my graduation from John Abbott College in the spring of 1990. For my high school graduation, she took me on a cruise to Mexico. Somewhere (probably with that box of photo albums) is the souvenir album we put together, full of formal shipboard photos, maps, tour flyers, and various other memorabilia. The cruise experience was probably mostly wasted on a painfully shy and socially terrified barely-sixteen-year-old like myself, but it was my first time outside of Canada or the United States, and I did love the sun and the sea, and seeing the historic sites the tours took us to. Also in that box of albums and memorabilia were stacks of programmes from my various theatre performances. I can’t remember which she saw and which she didn’t — Dad used to send her copies of the ones she couldn’t fly down to see — but she kept absolutely everything. She had a slightly crazy-making habit of underlining our names in printed materials. I have her copy of a privately printed large family history book called The Book of Menzies (also known as the “Red and White Book of Menzies,” written in 1894 by D.P. Menzie, the original printing limited to 100 copies; it belonged to her grandfather, one of the original subscribers who funded the book) in which she’s underlined several names. (She also used awful, cheap, sticky tape to helpfully mend part of the spine. My antiquarian book-lover side cringes at both.) I sent a signed and inscribed copy of each of my books to her as they were published; I wonder if she underlined my name on those title pages? Gran passed her copies of Emily Carr’s series of books on to me when I was an early teenager, which introduced me to a very different idea of Canada and Canadian art (yes, before I discovered the Group of Seven). About ten years ago, I tried to record a couple of orchestra concerts for her, but my poor minidisc recorder was just too overwhelmed by the amount of noise and it never worked properly. But on one trip out to see her, my parents took her to the local library and set her up at a computer terminal. She fussed, because she had no idea why they were doing it. But then Dad brought up the link to one of the videos someone had made of one of our concerts, and gave her the headphones. When he told her who it was and pointed me out on the screen, she beamed. The last time I saw her in person was in the summer of 2007, when Sparky was two years old and we all went to visit my parents so she could meet him. When Dad last showed her a picture of us, some time after Owlet had been born, she said, “Oh, what lovely children!”, but she didn’t understand that they were her great-grandchildren. Whenever I’d suggest sending her a current photo, my parents would quietly say, “Don’t bother. She doesn’t know. She can’t remember.” Telling her who everyone in the photograph was would entail an awful lots of explaining and backstory, and it was challenging enough to explain who my mum and dad were when they went to see her. The saying I will forever associate with her in various forms is “You can take your education everywhere; no one can take your education away from you.” She repeated this frequently, with various wordings. She thought it was just great that I kept on going to school and collecting diplomas. It alternately amused me and made me want to roll my eyes. I loved my gran, but she exasperated me a lot, too. The generational gap was just so large, and the way she saw the world was not the way I saw it. She also gushed a lot, and I am very bad at handling gushing, particularly when it is directed at me. I know that she was very frustrated and angry with life when her memory started to erode, and who can blame her? I remember feeling relieved when my mother told me Gran had reached a point where she was living almost entirely in the moment, just admiring the same flowers in the park over and over as they encountered them while they walked around the park. This post has been hard, not because I’ve lost someone dear to me, but because I no longer know that person. Or rather, the person who I knew and loved was gone long ago, and I’ve been able to mourn that loss bit by bit as my parents return from visits and update me on her decline. I’m grateful for the time we were able to spend together throughout her life, and for the opportunities she enabled me to have. I am so very glad that she is at peace now. This entry was posted in Blessings, Deep Thoughts, Photographs, Words Words Words on March 17, 2015 by Autumn. It’s recital day. I’ve had a rocky season with lots of downs and not very many ups. 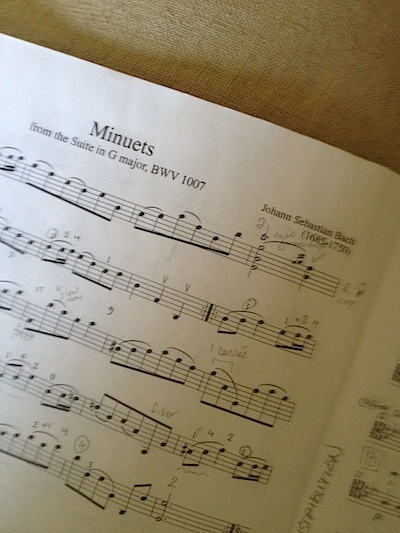 At a lesson in early May I got not one, but two bad pieces of cello news. As if cello hadn’t been hard enough for me (I’m having a really difficult time understanding and settling into musical lines lately, and it’s driving me up the wall), it suddenly got way worse: our principal cellist and section leader (who also happens to be my teacher) had been invited to teach at CAMMAC summer camp, and so she couldn’t play in our annual Canada Day concert. She would be replaced by a guest principal… who also happens to be the conductor’s wife. She is a lovely person, and a terrific cellist whom we’ve worked with before, but all of a sudden I felt like I had to work even harder on pieces that were already somewhat challenging, because there would be someone judging me (I know, I know, it’s a community orchestra, this doesn’t actually happen, everyone plays to the best of their ability, except argh). My confidence relies on my teacher’s presence a lot. And even worse, as there are only four celli in the section now, I am the second cello playing the upper line when it’s divisi, which means I’m playing a line with the principal cellist. Just her and me. And the top line is traditionally the crazier, more difficult one. No pressure. The second bit of bad news I got that day was my teacher suggesting that maybe my piece wasn’t in good enough shape this close to the recital, and perhaps we should pull something else out and dust it off. We hadn’t worked on it for a couple of lessons, focusing on the group pieces and orchestra music instead, and since I only have biweekly lessons, that means a month. But I didn’t have anything else, because I don’t work through the Suzuki books the way others do. Every piece I work on is my next recital piece. I have orchestra and Sparky’s lessons and group pieces for both the younger and the older groups, and so my efforts are spread over a broader field. I don’t measure my progress by how quickly I move through the Suzuki repertoire. (And a good thing, too, because I don’t need any more stress.) So I came perilously close to tears, and we worked through the rest of the lesson. I got home and tried to be objective, going through the few collections of music I have, and found a transcription of Wagner’s “Song to the Evening Star” from Tannhäuser. I didn’t have the piano accompaniment, though, so I did a bit of sleuthing online and tracked down an even better, more faithful transcription of the song on IMSLP. I sent it to my teacher as an alternate suggestion. She liked it, and we have it lined up for my Christmas recital piece. She apologized for making the suggestion at the time she did in the lesson, and said that by the end of the lesson my piece had already improved to the point that we didn’t need to substitute anything new. It was a hiccough along the road, that’s all, but it was hard while it was happening. Orchestra is… well. It’s feeling like a triage every week: What am I worst at that I need to beat into some kind of acceptable shape before next rehearsal? It doesn’t help that I don’t enjoy playing two of the pieces because I don’t like the music very much. Sometimes I grow to enjoy pieces I’m not fond of because playing them provides a whole different kind of appreciation, but not this time. On the other hand, we’re playing the very first piece of Tchaikovsky music I fell in love with as a young teenager, the waltz from Eugene Onegin, and the third act prelude from Lohengrin, which are lovely. But everything else I am either ‘meh’ about or actively disliking, which is a very odd place for me to be in. I’m not particularly looking forward to this concert. Sparky has been growingly sulky and whiny about cello. Part of this is nine-year-old self-expression, I know, and part of it is a general ‘I’ve had it’ with school and lessons; it’s that time of year. But he has asked to stop, has flat out said “I’m not doing cello any more after this recital,” and I’m of two minds. I would really like my cello time back to myself, to stop wasting money and energy on something that isn’t appreciated. (I could enjoy lessons and group class again! I could afford to have my own lesson every week!) But he does enjoy it when it’s going well, and he’s good at it. He’s at a point where things are improving rapidly, and dropping it now means that he won’t really see all the work he’s put in reaching a rewarding fulfillment for him. And yes, there’s also the fact that if we let him stop, he has gotten what he wants by whining and being disagreeable enough that I don’t want to deal with it any more. If he drops cello, he wins, and that’s the part I don’t like, because I don’t want to reinforce whining = getting what he wants. It just grates on me, especially since I’m with him every second of his cello life. In the end it’s the behaviour that’s unacceptable, and that’s what I’m struggling with. I am never going to force a child to go to music lessons if he actively dislikes them, but that’s not the case. He’s trying to avoid the work and focus, and the tactics he’s using irritate me a lot. If he presented me calmly with valid reasons for stopping, I’d be more okay with it. At the moment, I’ve said we’ll talk about it during the summer. Time off should help. We’ll see. If he decides he wants to stop, then he’ll be the one who tells his teacher, and presents his reasons. I’d be fine with him taking a season off, too, going back after Christmas. But if he decides to drop it completely, then he has to choose another extra-curricular activity, preferably one HRH could do with him. There’s a great karate school near us, and he’s always been interested in that; maybe he could try a session of it. The last time I worked on these with a teacher was about seventeen years ago. (Hey, did you know that as of this summer, I will have been playing the cello for twenty years? That’s pretty awesome.) The Bach solo suites. It’s like being handed the key to the inner sanctum of cellists. This entry was posted in Cello, Deep Thoughts, Music, The Boy, Words Words Words on June 8, 2014 by Autumn. I need to get back into journaling regularly, but I don’t really remember how to do it. You see, I had a weird incident last year that kind of broke me for a while. I’m a writer by nature and career, and writing things out is how I work through things. Not having this outlet has really undercut my ongoing healing process from living life in general, and you know what? Enough of that. Feeling like this outlet is blocked or broken hasn’t been conducive to being able to sit down and use journalling in all the ways I do – recording the good stuff, the family stuff, the confusing stuff, the ‘I feel really down and broken and I need to work through it’ stuff. I use this journal as a place to work things out when things are not going well; I need to work them out by writing, and I do that by writing in a place where people can sometimes give me feedback or support. It also keeps me honest: writing here means that there is an audience of some kind, and that’s important to me as a writer, because it gives me a sense of responsibility. I write differently for myself than for others. If it’s just for me, I’ll be lazy. If I know others will read it, I take more care in how I express myself, and it ends up being a lot clearer to me when revisiting it. After that incident last fall, I stopped trusting myself, I stopped trusting my audience, and it really broke me in a specific way that a writer can be broken. As you’ve seen, pretty much the only thing I’ve kept to is Owlet’s monthly updates (and I even skipped one of those). Anything else has been very irregular. I need to ease back into doing this, and I think a way to do that is to come up with some sort of loose schedule. Maybe Tuesdays I can jot down a few words on the spinning, knitting, and dyeing stuff I’m doing. Maybe Thursdays I can talk about cello, what’s happening in orchestra and in lessons, and maybe I can broaden the subject to include mention of the type of music I’m listening to, and new discoveries. Maybe Fridays I can talk about what I’m reading, online and in book form. I stopped doing my end-of-month book roundup right around the time Owlet was born, and not knowing what I read when has been driving me up the wall. Sparky deserves his own posts periodically, too. I stopped doing his monthly posts when he turned five (and I’ll do the same for Owlet), but as a result I’m not noting down the stuff that he’s doing very often, and I feel like I’m missing pages in his scrapbook, so to speak. Right now I am having an odd relationship with writing in general, and I think maybe my journalling issue is also symptomatic of that. I work very well while fixing other people’s writing — that’s what my career is right now, after all. I’m very happy with it, too; I’m good at what I do, and my clients seem to be absolutely thrilled with me and my work. I enjoy it, but I miss pure writing. I remember the feeling of writing; I remember working through an idea by putting words on paper to see where it went, and I miss that. In a recent editing lull, I went through some old novels that were in rough draft form or just missing the conclusion, and while I read and enjoyed them, I recognized that there were things that needed to be fixed. But I have this broken writing thing. I know that sometimes you just have to plunge into it, but that can be hazardous when one’s writing muscle has atrophied through lack of regular exercise, which is partly what journalling is. That incident last fall really cut my feet out from underneath me, and I’ve had to think about my identity as a writer, as someone who communicates and works with words, as someone who interprets the world through words. I used to do that as my job, and I really need to find my feet doing it again, so baby steps; I’ll start with this schedule, and we’ll see where that goes, where it takes me. I’m sure it will help in several ways, and among the areas of my life in which I’ll see a benefit are my mental and emotional states (both of which took a big hit in the past while, which has contributed a hell of a lot to my struggle with depression). I think one of the associated problems I’ve been having is that journalling seems so overwhelming now. I haven’t been writing things down for so long that when I do sit down to journal, I’m drowning in the amount of information I have to break down. There’s so much to say that I don’t know where to start, and I don’t know how to get it all down. And I’m constantly asking myself if it’s worth writing down, censoring the writing before it even happens. It’s frustrating, and it usually scares me so much that I don’t sit down to do it at all. As a writer, this paralysis has been devastating to me. I comment on life in my head throughout the day; I have a running narration going on, about what I’m doing, what I’m thinking, and so forth, and not being able to actually write that down somewhere in some sort of form has had a really negative impact on how I’ve been processing things, in dealing with information and events in my life. Not blogging probably doesn’t sound like much to some of you, but it is a fundamental shift in my outlook, in how I process and interpret the world and information around me, and there’s been a breakdown in my thought processing, in how I understand what or how I’m feeling. When that gets stoppered up, everything else starts getting slowed down, and there are traffic jams in how I emotionally assess things. I think that if I just start writing things down again, little things here and there, it will help me back to a better place in my relationship with words. At this point, what I write isn’t as important as just making a date to put a few words down a few times each week. I’ll use the rough schedule as a trellis, so that my expression has somewhere to climb; the guideline will offer me something to cycle through, but I’m not going to beat myself up if I miss a day, and I’m certainly not going to let that structure stop me from doing something at any other time. I think that if I journal more regularly, I’ll feel less intimidated because there won’t be so much to choose from when I do sit down. It will be easier for me if I can keep it to short entries, and it’ll be easier for you as readers because you won’t have to wade through a novella every time I sit down. This entry was posted in Deep Thoughts, Words Words Words, Writing on May 26, 2014 by Autumn. I think this is incredibly fascinating. Jacque Wilson’s article is called “This is Your Brain on Knitting,” but the observations extend beyond just knitting, of course. The hardest thing about knitting is the decision paralysis that grips me while starting a new project. I can’t just grab a nice yarn and start something randomly; I have to calculate yardage and ask myself if I’ll actually use the finished product (or if I know someone who can/will), think over the yarn’s construction and figure out if it’s appropriate for the item, and so forth. And then I have to grapple with the whole “but what if I do it wrong?” panic. Once I’ve started, things settle down, but even working through those questions comes very close to fight-or-flight for me. It’s not limited to knitting, either; it’s the same with fibre. There is a lovely braid of dyed Polwarth/silk blend that Ceri bought for me. Is it gorgeous? Yes! Will I love spinning it? Yes! Have I spun it? No, because what if I spin it wrong somehow? What if I make pretty yarn that is utterly unusable for anything I might ever want to make? What if I chain-ply it and decide after it’s done that I should have done a traditional three-ply, or even a two-ply? The entire article is interesting to read and makes several observations about crafting in general and its connection to dopamine release, the use of leisure activities/crafting in therapy, and the benefits of stimulating several areas of the brain simultaneously. In general, this is what a lot of crafters — knitters, weavers, painters, miniature railroaders, people who build RC aircraft — already know on a subconscious level. It’s calming, it makes you feel good when you complete something, and it’s an easy way to give your brain a break. It’s just interesting to read about it in more scientific terms, and to see what therapists and doctors have to say about it. This entry was posted in Deep Thoughts, FM/CFS, Knitting, Spinning, & Weaving, Links, Words Words Words on March 26, 2014 by Autumn.